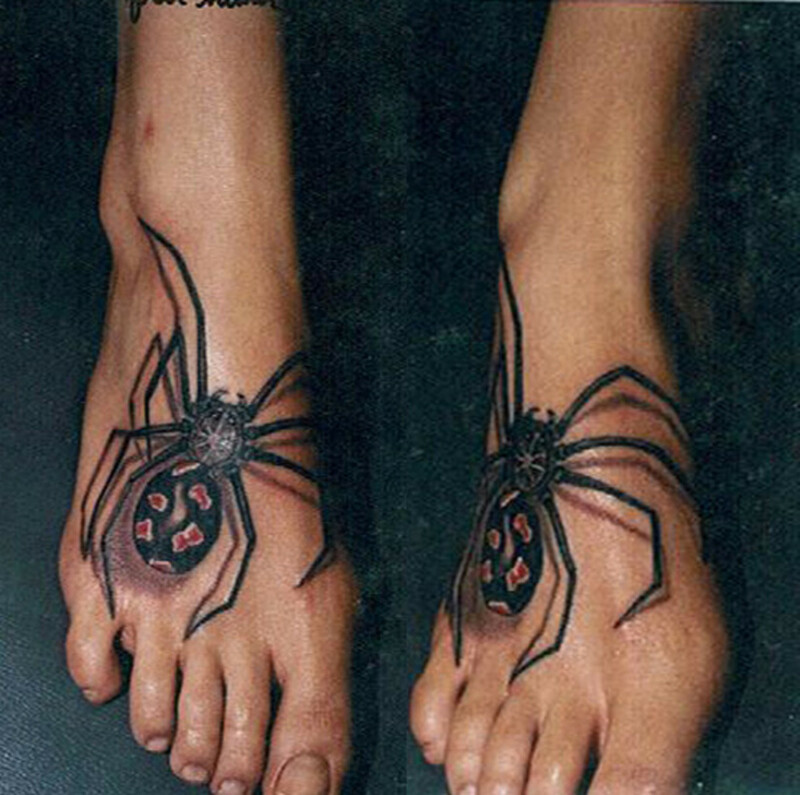 Spider tattoos are becoming amazingly realistic, and I am surprised at how many people have them inked on. The 3D spider design can look extraordinary. They not only look good from a design and art perspective, but they look so real I would imagine people wearing them have a number of concerned bystanders come up, yelling: "Look out! There's a spider on your arm!" They might even attempt to knock it off, specifically those on the shoulders and necks. You'll see for yourselves as you look at these photos that they're so well-done and realistic that it would be easy to mistake them for real spiders, which is probably part of the reason for getting them. 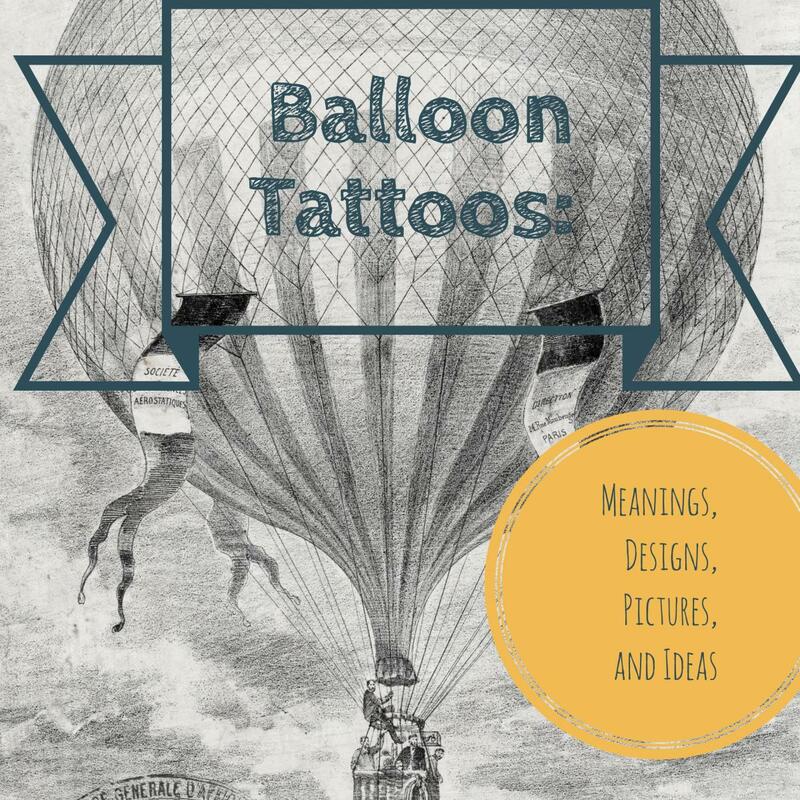 Not all spider tattoo designs are three dimensional, but a lot are, and the best-looking spider tattoos definitely jump out at you. 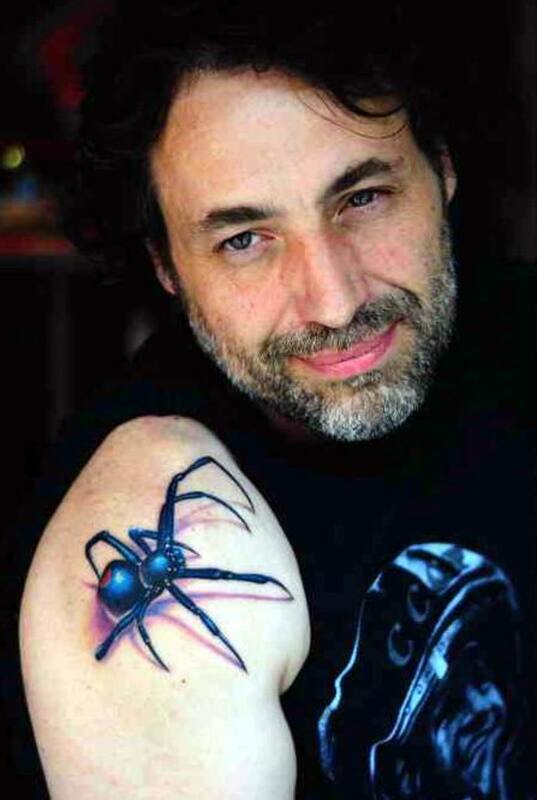 3D spider tattoos include the shadowing of the body and/or legs of the spider to fool your eyes so you'll think the inked creature is really standing on the skin, casting shadows. Full side rib spider tattoo. This is an amazingly big spider tattoo, one that is quite unique among all of those shown here. As you can see, it spreads around from the back to the ribs, creating a terrific design. 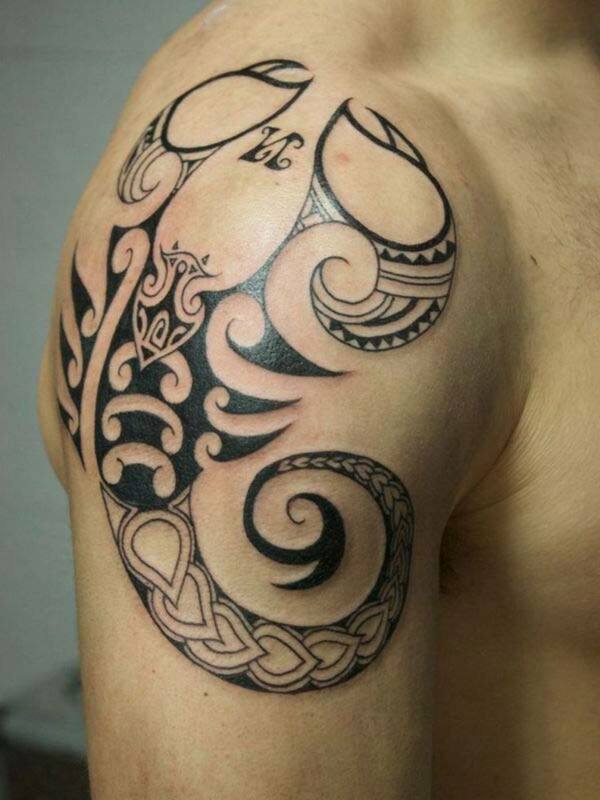 I like the dark color of the ink which adds to the impact of the overall look. Also looking cool is the kanji lettering inside the body of the spider. Tattoo of a spider's legs and body with a woman's head. 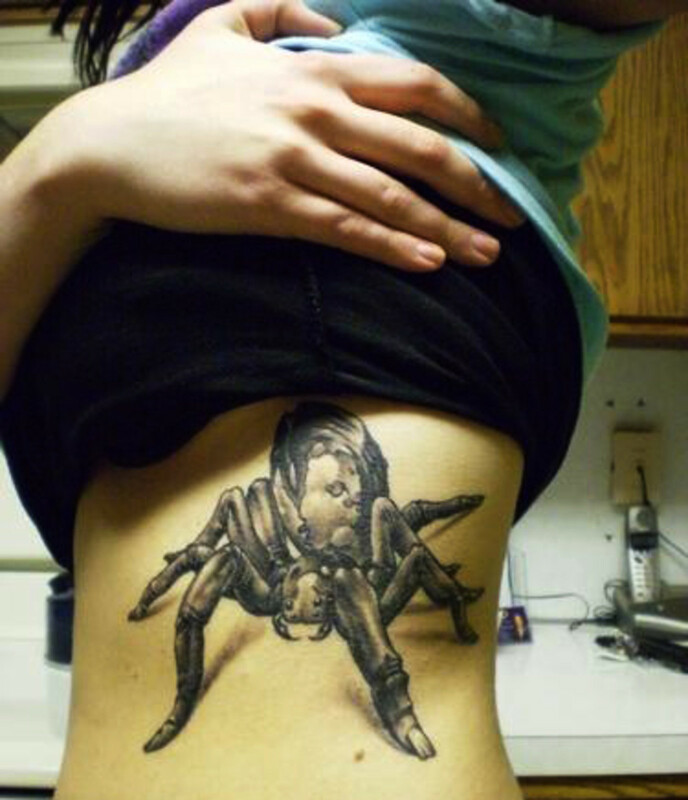 This is a cute tattoo of a spider with the face of a woman on it. I'm not sure if it was meant to convey the idea of a woman as a black widow spider which kills its mate, but it's a different look for a design. While this is the only spider tattoo with a web included in this gallery, it does show some of the potential of using a spider web as part of the design. 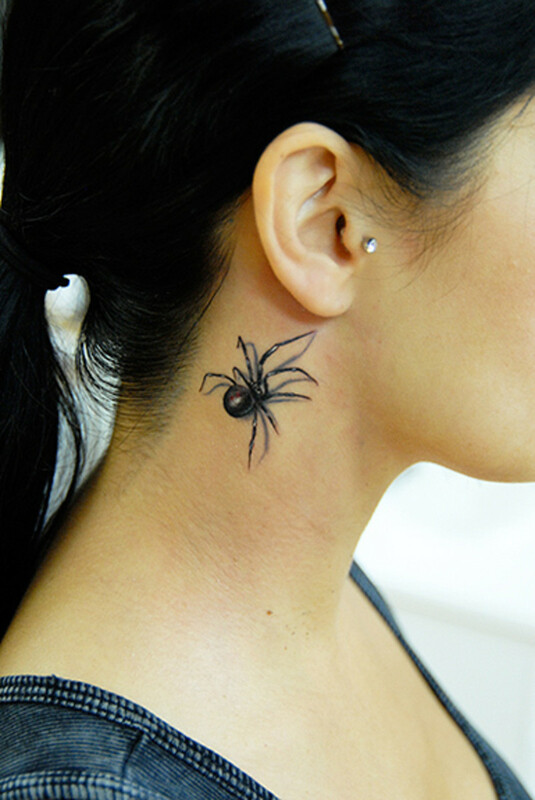 Does a Spider Tattoo Have to Be Black Ink? 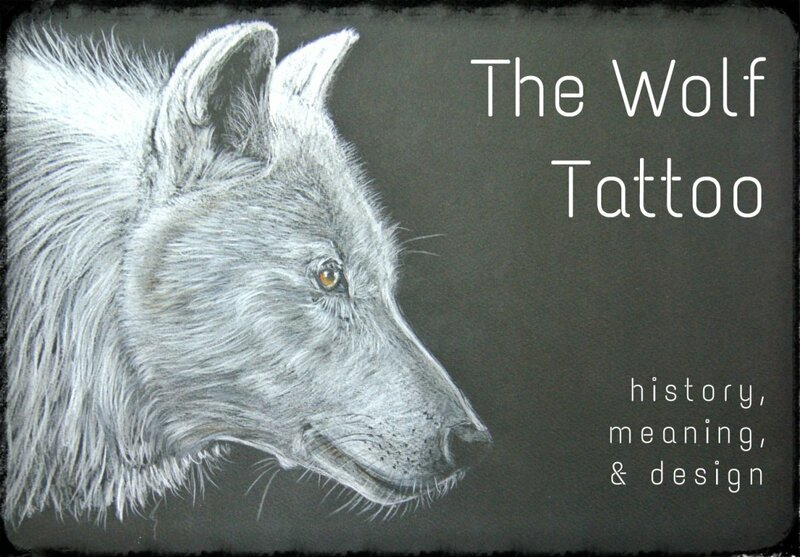 Using dark ink in body art is a great choice. That's the case with this large rib spider, which was done very nicely using my favorite ink color. It even could have been a darker hue to make it stand out even more, but as it is it's still very nice looking. Did you notice the fascinating use of the fingernail at the tip of the foot of the spider? Very creative. 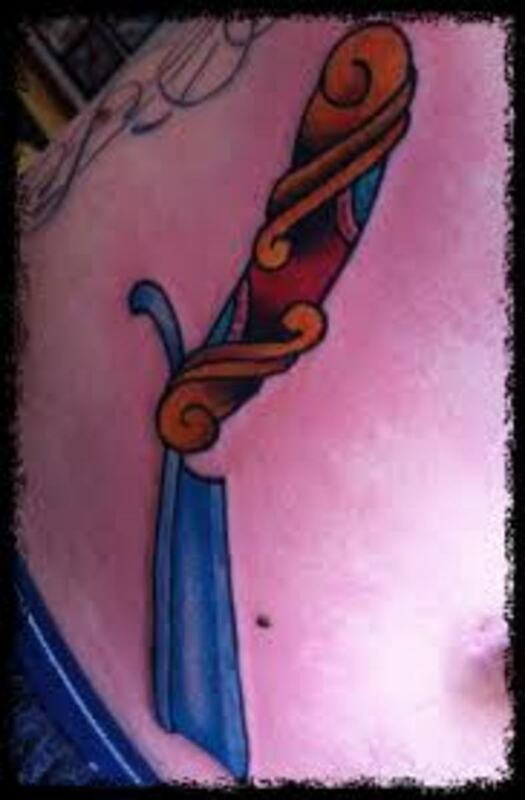 Having a tattoo inked on the neck can be a good choice, if it's done carefully. Remember, you'll always want the option of covering a neck tattoo. 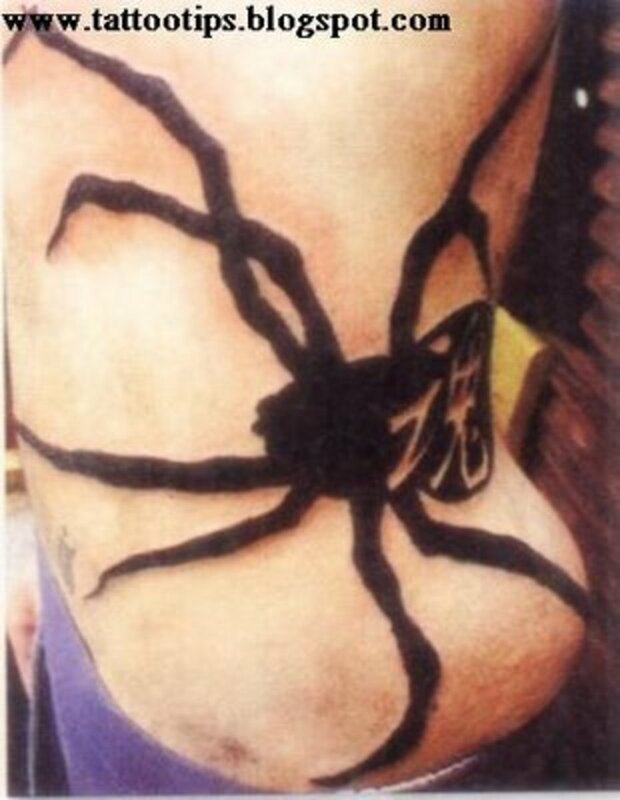 In this case the spider can easily be covered by long hair to hide it when needed so it's not an impediment to certain social situations where it could be detrimental, things like jobs or special events which call for less drama and statements via body art. 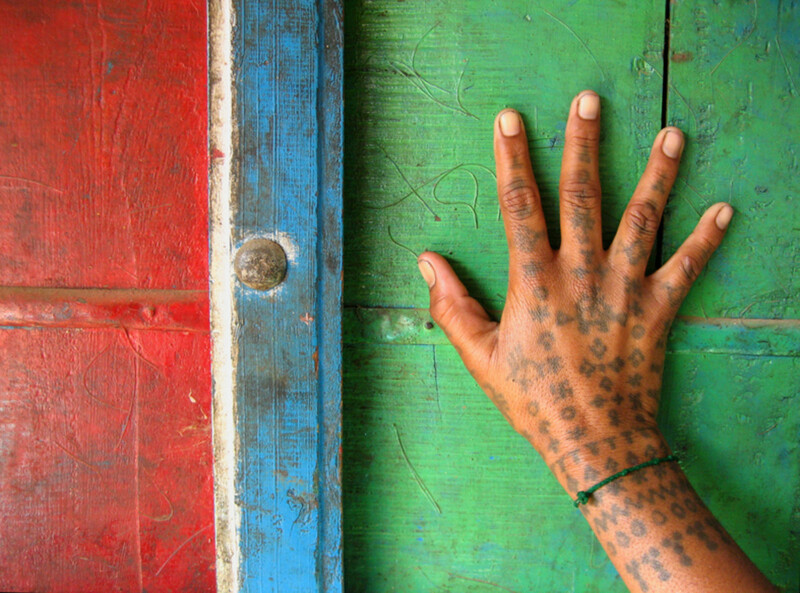 The ability to cover a tattoo is an important one, and one that should be considered by most people getting inked. 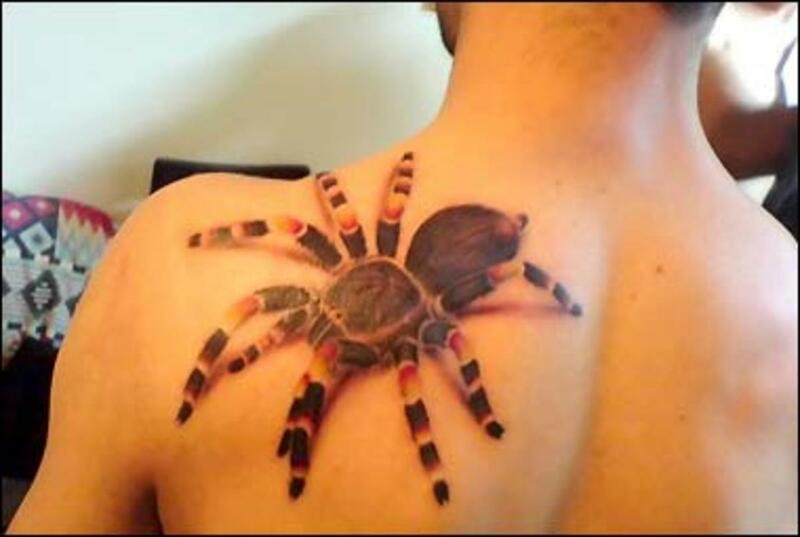 One thing is for sure, the quality of spider 3D tattoos is important. It takes an experienced and talented artist to get the shading just right, and a great artist can create one you'd swear was the real thing. That's quite an accomplishment. 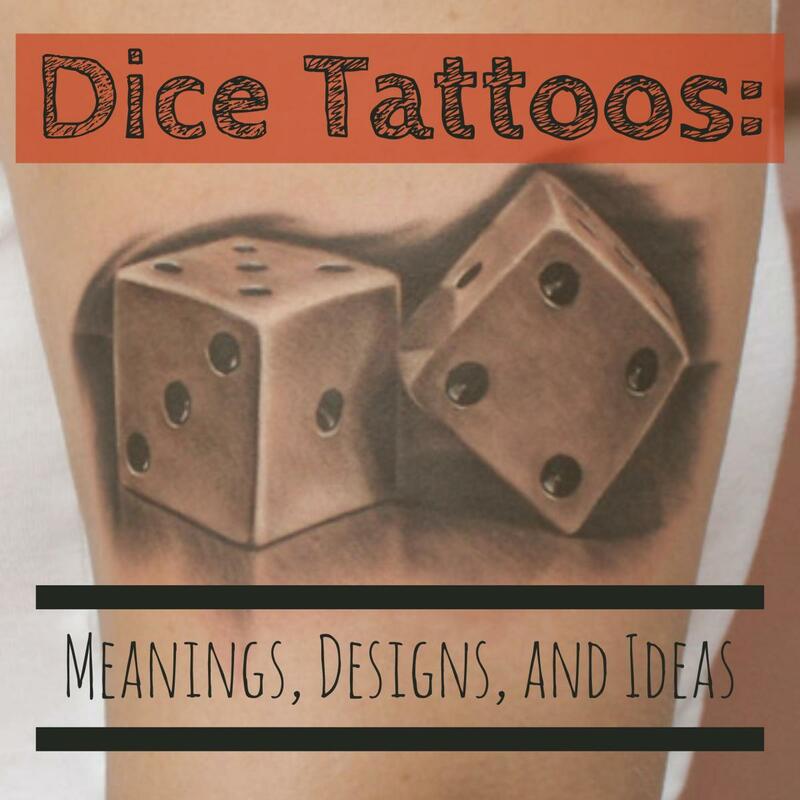 Overall, spider tattoos do have a unique look that is sure to garner attention and generate comments and conversation. 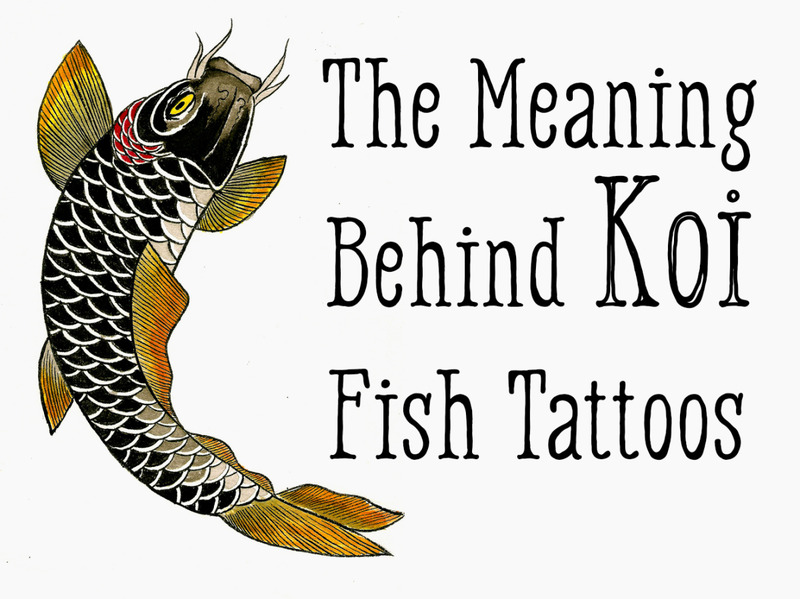 And when you think of it, that's probably the two top reasons for getting some ink in the first place. 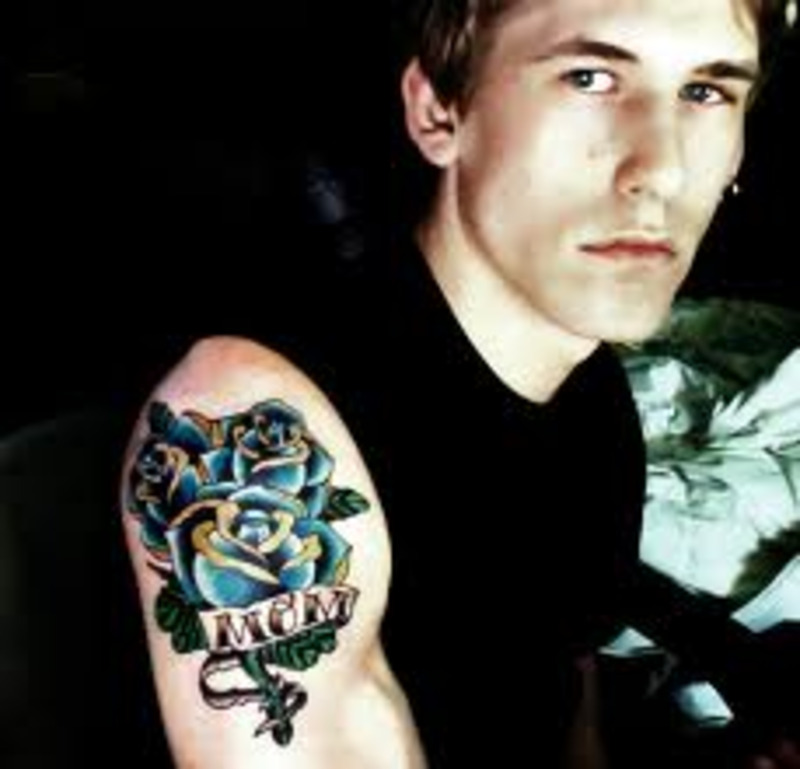 nice 3d tatto, where you got that? i love it! hi there, the tatantula on his shoulder is absolutely awesum, great job! OMG, the top pic is the exact design I've been wanting to get for years! It's a Brachypelma smithi (Mexican Redknee) Tarantula which is the first species to start my collection. I dig spiders and would like a tat to represent that.